So my drum teacher quoted a famous drummer today and he said "drumming is 33% reading, 33% technique, 33% research and 1% a good pair of shoes" and he laughed and I was liked err..I kinda practice barefooted, is that ok? and he just shrugged. Its jut a habit of mine to practice barefooted, will that affect my development at all? Yea, I hear it gives you planters warts. I'm just kidding. Hey I used to play barefoot and look at me now.... I have warts covering both feet! Just do whatever is comfortable to you. I like the traction i get on the pedals with light, low-top shoes on like Chuck Taylors or Vans or something. I think my feet slip too much when i have just socks or barefeet. I knew a guy that would practice in heavy work boots because he thought it made his footspeed quicker. kinda like weight training i guess. I play the drums with no shoes and socks on... it's so much more comfortable when i'm not wearin' shoes... and it's more easier hehe! Every thing is more comfortable without shoes and socks...but then this is the Bahamas! Playing barefoot is where it's at! I noticed some drum shoes on ebay and they looked like beach shoes I have. I tried them and I like playing with them. They are made of a thin material and they are very lite. They also have a thin rubber bottom and I can feel the pedals better. I have stated in another thread on this subject that Steve Smith suggested using capizio Jazz dance shoes because the soles are so thin and flexible. I pretty much just wear whatever mostly skate shoes on casual gigs and dress loafers on more dressy occasions. I don't notice a restriction or grip problem with either shoe. Really there is no right or wrong wear or don't wear what ever you want. ive, been rockin' my adidas since run-dmc's raising hell album came out. i've seen these in the store and they are ultra light. i've been thinking of picking some up. Just have your feet be comfortable. Don't overthink it. I am not comfortable at all barefoot on the drums, a good pair of new balance shoes and i feel right at home on the pedals. I use a pair of slip-on slippers/mocassins, "fur" lined with a thin plastic sole. Keeps the grunge and crud from the floor of the clubs off my precious tootsies and still allows for me to feel the pedals. Used to use a pair of black Chuck Taylor hi-tops until I found the mocs. Amen brother! This applies to a lot of the threads in here. None or a pair of good ol' fashioned converse hi-tops with a Zildjian Sticker! anyone ever use wrestling shoes? that was pretty popular in the 80s. Actually, Neil Peart's "Der Trommler" video show him wearing what looks like wrestling shoes. I would imagine that they would give you all the sensitivity you could handle with good "grip" on the pedals. Once again Herb Utsmelz comes through with his dead pan logic. I find my self agreeing with him more often than not...scary!!! well, a couple days ago i actually bought the ADIDAS goodyear race car driving shoes. got em for 40 bux from the burlington coat factory. i wanted to try them when i saw them before, but they were 80 bux. i had really forgotten how much of a difference a good tight pair of shoes makes. they are feather light and have a very thin sole that really lets you connect with the pedals. i will never play in my big bulky ADIDAS shelltoes again. Converse all-star's all the way for me. I used to love suede Converse All-Stars when I was in high school! 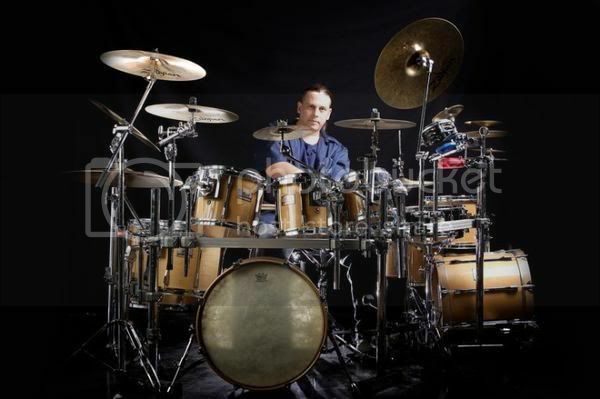 Welcome to Drum Chat Sonor! yep, i used to like the ol' chuck taylors. funny how shoes that were 10 bux and 30 years out of style in 1990, are back in fasion and 65 bux now...kinda like the checkered "spiccoli" style vans.